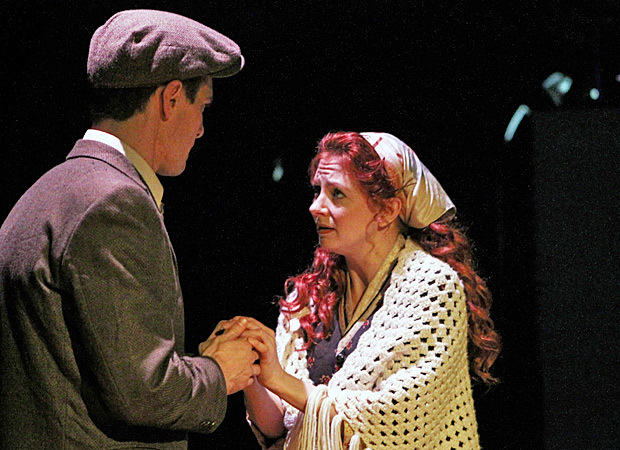 Bella’s Dream, the debut play from Dana Boll, which runs through June 30 at the Flamboyan Theatre, follows the globetrotting journey of her grandparents as they flee Poland on the eve of the Nazi occupation. Prompted by a premonition of impending danger, Bella (Lisa Kathryn Hokans) convinces her husband Raymond (Jon-Michael Miller) to uproot their lives to avoid the impending war in Europe. The play chronicles the couple’s harrowing journey across Eastern Europe and Central Asia, while flashing forward to present day America, when their granddaughter (Boll, playing herself) discovers the truth about her grandparents’ experience during World War II. With no drought of Holocaust stories in our culture, it’s refreshing to witness one with a different direction, in which the concentration camps are absent. Bella and Raymond’s story involves few Nazis and instead places them in harsh Gulag work camps, encounters with ominous strangers and battles against the elements. These two characters clearly know nothing about crossing the Siberian tundra, yet they conquer every obstacle and the effect is nothing short of uplifting. The undercurrent to their survival is an inspiring devotion to their marriage and Jewish faith, which Boll handles delicately. While Boll’s writing would benefit from a more streamlined storytelling, the tale is deeply personal and the respect she creates within the play for her grandparents’ history is easily relatable. The discovery of the true story behind her grandparents’ survival during World War II is a revelation for Boll, both in real life and within Bella’s Dream. That Boll is able to immortalize her relatives’ strife and eventual triumph is not only an incredible tribute to her family, but it also renews the cycle of tradition and respect for heritage that pervades through Bella and Raymond’s story. It is once again a reminder that the fight for freedom during the Holocaust went much deeper than the here and the now.